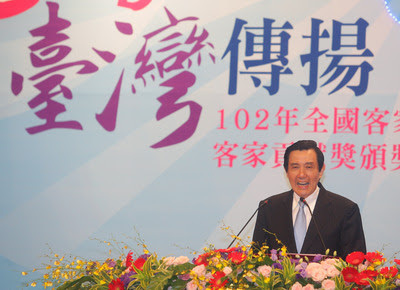 On June 16, President Ma Ying-jeou (馬英九) attended the National Hakka Conference. In addition to presenting the Hakka Contribution Award, he made sure that he stressed the results of his Hakka policies. The address, the whole of which was delivered in Hakka, won him enthusiastic applause. Ironically, it was not that long ago that the Control Yuan proposed corrective measures to the Hakka Culture Park project. It is clear that the government’s Hakka policy must be further consolidated, and that the National Hakka Conference has its job cut out for it. First, current policy is focusing too much on facilities and not enough on support. New Hakka cultural centers are constantly being built around the country, but only a handful of these centers are being effectively run and connected to cultural workers at the grassroots level. Most of them are becoming breeding grounds for mosquitoes, or are being put to other uses. The cultural parks that have been established at great expense in Miaoli County’s Tongluo Township (銅鑼) and Pingtung County’s Neipu Township (內埔) may be beautiful to look at, but there is no substantive connection between these parks and the Hakka villages where they have been established. The thinking that locks up Hakka culture in museums should be abandoned. Instead, the issue should be looked at from the perspective of eco-museums, which could be used as a platform to connect Taiwan’s Hakka villages. This would not only offer a living Hakka culture, it would also bring a potential rejuvenation of the villages. The best example of this approach are the Hakka villages concentrated along Provincial Highway No. 3 and in the Liouduei (六堆) area. Second, there is still much hype surrounding Hakka policy, but it is not going deep enough. This is the danger with the current festival-focused policy. The annual 12 Major Hakka Festivals rely on short and well-publicized activities to attract the attention of the media and local Hakka communities. These events burn up huge budgets, but fail to energize local culture. Government resources to vitalize Hakka cultural festivals, should be directed at the skills acquired through continuous day-to-day training and not just focus on the festival as a temporary performance. Cultural festivals should be seen as a way to bring forward more Hakka performance troupes and traditional folk artists and to engage the younger generation. They should also be used to provide a more permanent platform for continued promotion and consolidation of cultural work. Finally, the policy should not be disconnected from, or even function in opposition to, the issue of Hakka village development. These villages are predominantly rural villages and they are currently at risk of being emptied. While Ma vowed to bring prosperity to the villages at the National Hakka Conference, other policies continue to expose these villages to ecological disaster, causing people to move away. Two examples are the algal reefs in Taoyuan County and the Tienhuahu Reservoir project (天花湖水庫) in Miaoli County. How is the government proposing to bring prosperity to Hakka villages and to vitalize the culture when people are moving away? As local economies slump, the social economy is held up as a force that will revitalize communities and create more equal and sustainable development. In reality, it is the traditional connection between clan society and local communities that has provided the development potential for the social economy. The Hakka village economy can step out of this narrow framework and connect to the social innovation that is occurring in the much wider agricultural and care sectors. The policy should not only be a matter of the Council for Hakka Affairs building shiny facilities or organizing bustling festival activities. As Ma’s Hakka language skills improve, we are looking forward to the emergence of Hakka policies that rely on new and innovative ideas, such as the eco-museum and social economy concepts. These would consolidate Hakka culture and provide the villages with an environment conducive to sustainable development. Liu Chieh-hsiu is secretary-general of the Taiwan Hakka Think Tank. Tseng Nien-yu is president of the Taiwan Hakka Think Tank.